Alessandra Bruni Lopez y Royo is an independent scholar, Research Associate of the Centre for Media Studies, School of Oriental and African Studies (SOAS), University of London since 2004. Formerly she was a full time academic in post, holding a position as Reader in Visual Culture and Dance Performance at the University of Roehampton until 2013, when she decided to go freelance after making public her sense of discomfort with the current turn in the academy. Her original research area was Asian Studies, inclusive of visual arts and performance practices, and with a focus on South and Southeast Asia but over the years Alessandra developed other interests, encompassing media and film, reflected in her writing and research output. 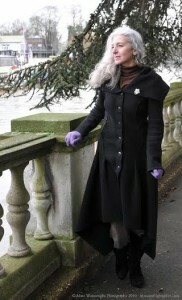 Much of Alessandra’s research has been informed by her fascination with psychoanalytic theory which she engaged with by attending lectures and seminars at the Centre for Freudian Analysis and Research and the London Society of the New Lacanian School, following a short lived interest in dance/movement psychotherapy. Alessandra is also a model and a blogger, for which she uses a pseudonym. She has been modelling for some years, performing a careful balancing act with her career as an academic. Alessandra is currently gravitating towards ageing and women’s studies, inclusive of fashion and media, and hopes to contribute more to this growing research area, looking more specifically at fashion developments in Asia.